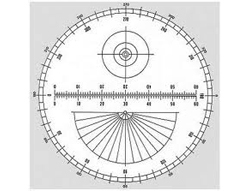 A reticle is a glass disk with an etched measuring pattern. These glass reticles offer greater stability than film reticles which can bend, warp, and easily be damaged. Patterns are low reflection chromedeposition for high contrast and easy readability.